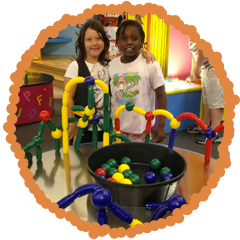 The rich and playful color palette of the Museum greets children and their caregivers as they enter the world of “Our Town” with an abundance of hands-on, multi-sensory, unique and appealing exhibits geared toward learning through play. 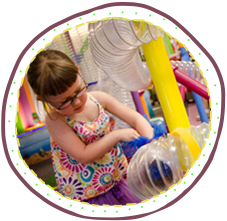 KidsPlay Children's Museum is designed for children ages 2-8; however, younger and older children find challenges and just plain fun once they enter! The children explore on their own with no need for directions as to how to work and play; their imaginations and creativity are their guides. KidsPlay Toddler Area is reserved for children 2 and under. 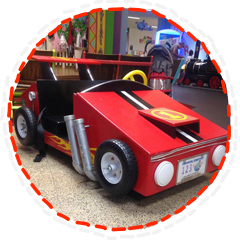 This space is perfect for your crawlers, cruisers, and beginning walkers. There is a soft, padded floor and large pads for climbing and exploring. Plus lots of stimulating games and toys mounted on the walls at just the right height. Load colorful balls on the paddles of the elevator conveyor and crank the wheel to make them slowly climb to the top! Disappearing briefly, they reappear spiraling through transparent tubing finally bouncing down a zigzag channel and dropping into a basket at the child’s feet! Challenge: How many balls can be conveyed at once? 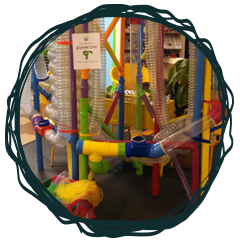 Feed colorful balls into the forced-air stream and watch them race through the transparent tubular maze of loops and spirals! The balls then drop into a 10 ft. ball-filled Silo, which feeds down into a circular retrieval pit. A smaller, lower version is available for our youngest guests. 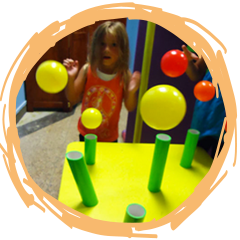 Challenge: Anticipate the ball’s pathway, see how many balls can be introduced at once and still move successfully, open and close the air flap and see how the movement of the balls are affected or pick particular colors and create a pattern in the tower. Grab and place balls into the air stream of multiple blowers pointed in different directions. Challenge: How does that ball stay in the air? Ever imagine yourself in a bubble? See what the world looks like through a bubble! 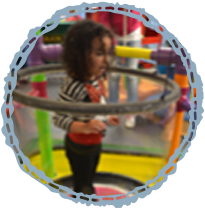 This exhibit allows the child (or adult) to be encased in a bubble by using a chain to pull the solution up out of a tub surrounding the standing platform much to the delight of the participant. Challenge: Blow on the bubble wall to form unusual shapes without popping! Visit our authentic Fifty’s Diner complete with a Betty Boop statue! Children delight in pretending to cook, serve and wash up in our kitchen with special aprons and a large selection of foodstuffs, plates, pots and pans, and utensils. 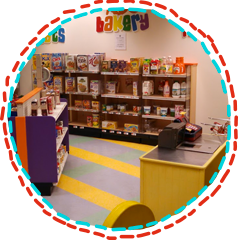 Caregivers or other children can sit at the child-sized counter and enjoy the "food" and service! 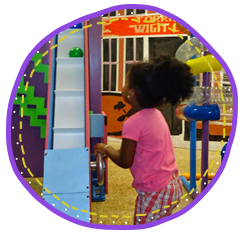 Enjoy your experience in The KidsPlay Diner reminiscent of Torrington’s Skee’s Diner. 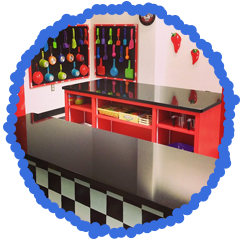 Challenge: Match the utensils, pots and pans to the correct cutout shape when putting items back on the color-coded pegboards. Where’s the fire? 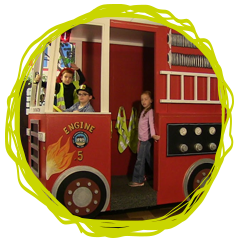 Slip into the firefighters’ vest and fire hat and jump into the driver’s seat of the Fire Truck constructed and painted by our own Torrington Fire Department! Complete with revolving and flashing red light, brass bell and walkie-talkie, there is no limit to a child’s imaginary adventure as the truck “races” through the city streets! Stopping at the scene of the fire the water hose at the back of the Fire truck can put out even the fiercest of fires! Fit the colorful one-inch transparent rods into the holes to make designs and shapes! Lit from below, the light fills the rods and lends a unique and artistic opportunity to use one’s imagination. 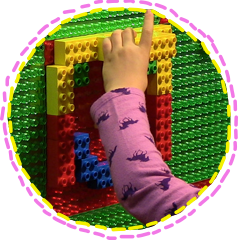 Challenge: What brilliant designs can you create on the giant pegboard? Children love to imitate adults – and what better place than a child-sized grocery store. Pick up a shopping cart and visit our grocery aisles filled with real food boxes and canned goods as well as plastic fruits and vegetables. Don’t forget to visit our cooler for dairy products and our bakery for bread and other delights. Full cart? Time to check out at our checkout counter; beep goes the scanner, cha-ching goes the cash register! Be the shopper or the checker. Challenge: "Part of Play is Putting Away", the children put the groceries back in their places by finding the picture or number matching the items. Did you ever think there could be more of you than you could imagine? Climb inside our three-sided Infinity Mirror and see your image projected forever! Children delight in making faces and seeing themselves forward, backward and sideways in this surprising exhibit. Have you ever built a Lego design on a wall before? Come and try out this whole different perspective of building on a vertical surface. On the other side is a magnetic puzzle wall with wooden puzzles pieces that magically stick to this vertical surface. Also, experience interlacing gears and turning them to create a string of moving parts. Or put together our magnetic shapes in our “mix and match” puzzle section to make imaginative creatures with a Rhinoceros head and Kangaroo legs! 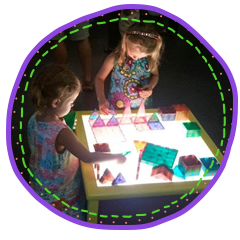 Make flat designs or build three-dimensional castles with the colorful and transparent geometrical shapes lit from below. Make a circle using triangles; build a tower using squares, rectangles or various shaped triangles. Challenge: How high can it be built and what shapes are needed? Experience the fun and mystery of magnetic construction! These jumbo-sized pieces allow smaller hands to use huge imaginations as shapes and towers are built upon our stainless steel round table. Assisting in developing hand-eye coordination, recognizing shapes, patterns, and colors as well as challenging children to build and test “how high can it go” is all part of learning through play! Dads like it too! Love to perform? 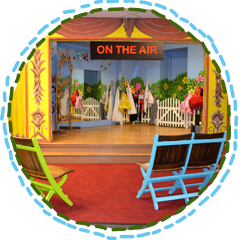 Children can put on a play in our beautiful “theater”, complete with colorfully painted backdrop, mirrors, props, musical instruments and costumes. Step down the two steps to the seating area where guests can enjoy the performance in our special theatre seats. Enjoy the painted facade designed after Torrington’s Warner Theatre. 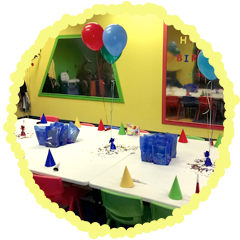 Be amazed by this large, cheerful room where Birthdays can be celebrated or programs can be conducted! We’ve had stories read by Mother Goose, music classes, soccer clinics, and live animal visitations in this room. The walls are decorated with large trapezoid, triangle, square and rectangle-shaped magnetic mirrors where birthday messages or program announcements can be spelled out in magnetic letters or numbers. 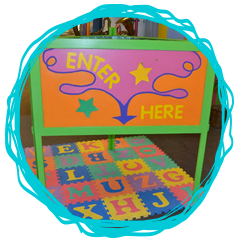 Colorful tables and child- and adult-sized chairs are available as well as cake/present tables and a wash-up sink. Where do those vegetables come from? 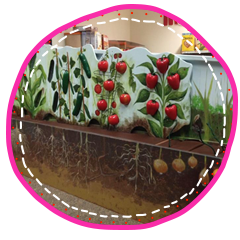 Learn what veggies grow under ground as they are "harvested" from the whimsically painted garden – potatoes, beets, carrots and onions! Challenge: "Replant" them by matching the veggie to the backdrop picture! Take a seat, buckle up, grab the gearshift and start the engine!! Imaginations soar as children “race” around an imaginary track or take a leisurely drive through the countryside with their seatmate! Stop off at the racing pit or the local gas station and change the removable tires by turning wing nuts. After twisting off the gas cap, fill the gas tank with our very own KidsPlay gas pump. Check the headlights and resume the adventure. Set against the backdrop of a colorful car wash mural, the car can be "washed" with available buckets and cloths. Stuff a silk scarf into the forced-air stream; follow it’s travel through the transparent tube as it loops, ascends and descends; anticipate it’s pathway as it closes in on the end of the tube where it shoots out into the air above the child’s head and allows big motor movements -- jump, reach and grab! 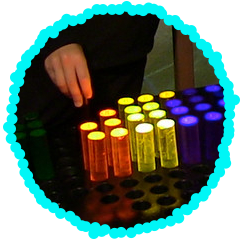 Younger children can pick out particular colors as requested by an adult or name the color as they place the scarf in the tube to begin it’s journey. Since there are two side-by-side Scarf Throwers, older children can compete with one another. Challenge: How scarf placement into tube (rolled up or fed flat) may affect speed and playing the game of successfully catching the floating scarves.